I love Mexican food. 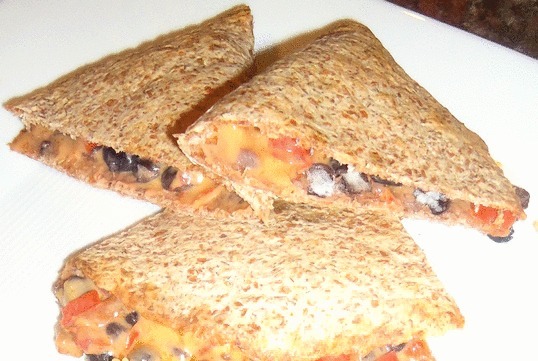 One of my favorites is Quesadillas! I love the taste of red peppers, onions, the spices and all the goodness that comes with Mexican food. I really wanted to make a cheese option, but also one without for those who prefer not to eat vegan cheese. I found the perfect substitute, Spicy Red Pepper Hummus! I have used hummus as a pizza topping before and it gives a lovely creaminess like cheese, so I knew this flavor option would work great for Quesadillas. Step 1. Finely chop one large red pepper, 1 pint Portobello mushrooms, and 1/2 onion. Place the chopped onion and mushrooms onto a non-stick pan. Saute on medium heat using a little (about 1 tsp) olive oil, season with a pinch (or more if you like) of the seasonings listed, stirring continuously. When the onions are golden and appear soft, add the chopped red pepper. Stir. Lower the heat to low, and let cook for 5 minutes. Cover and remove from heat. Step 2. Place one tortilla onto a clean plate. Using a cheese grater, grate cheese onto one half of the tortilla. All you need is one thin layer, as Daiya Cheddar Cheese is very smooth and creamy…a little goes a long way! Place about 2 Tbs of the sauteed veggies, 1 Tbs black beans, and another thin layer of cheese on top. Fold the tortilla in half, and place on a cookie sheet. I used parchment paper on the cookie sheet for easy clean up, and to avoid any unnecessary sticking! Step 3. Place one tortilla onto a plate. Place a thing layer of hummus on the entire tortilla. Scoop 2 Tbs of sauteed vegetables on one half of the tortilla, along with 1 Tbs of black beans. Fold in half and place onto the cookie sheet. Hummus is a great alternative, it melts quite nicely and is the perfect texture for a melted ‘cheese’ alternative. Continue this process until you have used all 6 tortillas! Alternate between hummus and cheese, making 3 of each. Place in the oven, on the middle rack and bake approximately 5 minutes or until tortilla is a crispy. Using a spatula flip the Quesadillas over and bake for another 5 minutes. Serve with a side of rice! Add a side of salsa and guacamole to complete the meal!